A team of researchers from several institutions in the U.K. and one in South Africa has come to the conclusion that the broiler chicken offers perhaps the most striking evidence of the rise of the Anthropocene. In their paper published in the journal Royal Society Open Science, the group outlines their reasons for choosing the chicken as a signal of human biosphere reconfiguration. Scientists have begun suggesting that we are now living in a new epoch, which thehy call the Anthropocene—the age of man-made impacts on the planet. In this new effort, the researchers suggest the broiler chicken is a prime example of the changes we have wrought. They note, for example, that the broiler chicken is now by far the most populous bird on the planet—at any given moment, there are approximately 23 billion of them. The second most populous bird, by comparison, is the red-billed quelea, and there are just 1.5 billion of them. 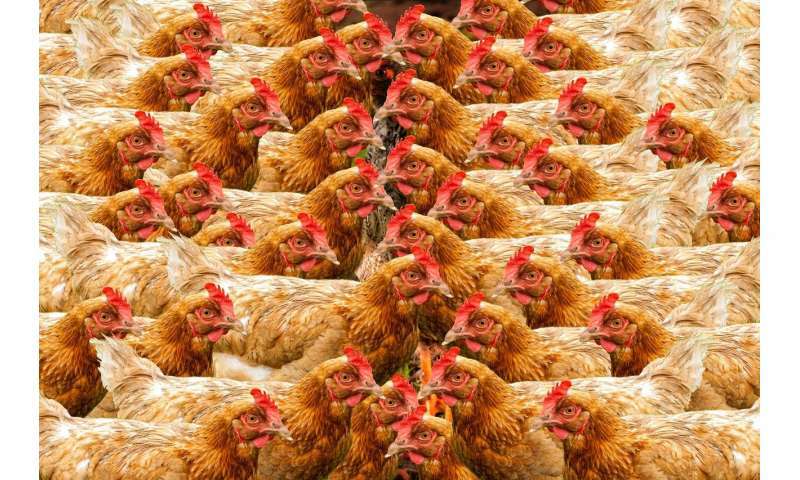 There are so many chickens that their body mass is greater than all other birds combined. And they are not anywhere close to their initial native state—the modern broiler is unable to survive and reproduce in the wild. It has been bred to eat non-stop, allowing it to grow to a desired size in just five to nine weeks. And as it grows, its meaty parts outgrow its organs, making it impossible for many to survive to adulthood. And all these chickens are being cooked and eaten, and their bones are discarded. Billions of bones wind up in landfills where they are covered over in an oxygen-free environment, making it likely that they will, over time, become fossilized. If we do not survive due to global warming, pandemics or nuclear warfare, the researchers suggest, the next dominant life form will likely dig up our landfills and find evidence of our love for the broiler chicken. The idea of the broiler chicken as a symbol for our time here on Earth may be unsettling, they note, but other options do not sound much better. We will also be leaving behind things like plastics and radiation signatures.